At Medlin Mazda, we understand how difficult the car-buying process can be. There’s so much pressure to get the right car or SUV that it can be overwhelming! Plus, there are just so many options in each class to choose from, that sifting through them all to find the perfect model can seem impossible. Of course, we believe that Mazda vehicles always offer drivers the best value, but we’re not just going to tell you, we’re going to show you! With our latest model comparison page, we’re going to be breaking down the key specifications of the 2019 Mazda CX-5 and the 2019 Toyota RAV4. We create these comparison pages so drivers can see exactly how Mazda stacks up against its top competitors. We’re going to be looking at the base models for both compact crossovers and what exactly they’re bringing to the table for drivers. Let’s see which crossover comes out on top! Test Drive the 2019 Mazda CX-5 at Medlin Mazda in Wilson, North Carolina, Today! As you can see from our table comparing the key specs of both crossovers, it’s not a mystery why both are so popular among drivers! Both the 2019 Mazda CX-5 and 2019 Toyota RAV4 offer drivers impressive value across multiple categories, whether it’s affordability, performance, capability or interior space. 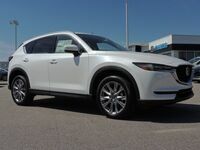 However, looking at the two head-to-head, it’s clear that the 2019 Mazda CX-5 has the edge in this comparison. First, let’s start with what drivers are going to have to pay to get either of these models. When it comes to starting MSRP, the 2019 Mazda CX-5 has the edge over its Toyota rival, coming in at over $1,000 less. Plus, drivers can get a great deal at Medlin Mazda, so the new crossover is even more affordable. But the 2019 Mazda CX-5 is more than just an affordable crossover. It also offers more performance in the way of torque, besting the 2019 Toyota RAV4. Combining that power with the 2019 Mazda CX-5's incredible durability, it also offers a higher towing capacity than the 2019 Toyota RAV4 can, 500 pounds more! Plus, the 2019 Mazda CX-5 also has a larger interior when it comes to passengers. With the 2019 Mazda CX-5, drivers can comfortably seat up to five passengers with more room than in the 2019 Toyota RAV4, so no one feels cramped no matter where they sit! Want to learn more about the 2019 Mazda CX-5? Ready to get behind the wheel of one? Contact our staff at Medlin Mazda for more information or to schedule a test drive today!